‘People like to see where their food is produced,’ says Duncan Stewart, manager of Falkland’s Pillars of Hercules farm. ‘Here you can see things growing in the fields and put a face to the person who’s producing the food, which means a lot more than just looking at a label in a supermarket and seeing where it’s from.’ He may well be right, but does this collective desire to get back to nature wholly account for the energetic diversification of many Fife farms with shops, cafés and even childrens play areas in recent years? Treina Samson, manager of the shop and café at Balmalcolm’s family run Muddy Boots farm, gives another plausible reason. ‘We predominantly used to grow raspberries for supermarkets,’ she says, ‘but we were losing money on the terms they offered. One year we had the most amazing crop, but the weather wasn’t great and the supermarkets dropped their orders. So we ended up selling our raspberries in a tent at the side of the road.’ A little over two years ago, Muddy Boots stopped supplying supermarkets to concentrate on stocking their own shop. The farm has also diversified their crop, and now grow asparagus, rhubarb and a range of soft fruits, including their Tulameen raspberries. ‘It’s a gorgeous fruit,’ says Samson, ‘but its shape means it tends to collapse quickly.’ So its taste is matched by the shortness of its shelf-life. 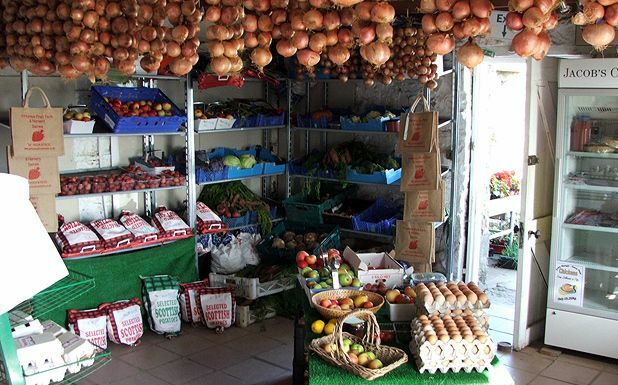 Farm shops, in other words, offer a freshness that supermarkets just can’t replicate. ‘Supermarkets are cheap,’ says Euan Cameron of Dairsie’s Pittormie Farm, a smaller, cottage-sized shop, ‘but they’re cheap for a reason. We find that people don’t mind paying a few extra pennies for eggs that are a few days old rather than a few weeks.’ Pittormie is another farm which is self-sustaining, growing exclusively for sale in their own shop. Although they’ve occasionally bought in supplies from elsewhere, like beef from Puddledub, their motto is ‘if we can’t grow it, we don’t sell it.’ This includes fruit, vegetables, plants and free range eggs. With studies showing a significant loss of bees in the UK over the last two decades, the pressure to save the nation’s honey-makers is on, especially after 2009’s cool damp summer and sharp winter. The Beekeeping Association in Fife has existed for nearly a century, but in the last few years has seen a continual rise in membership numbers, making it one of Scotland’s largest, as interest in apiculture has grown. Throughout the county, the association offers lessons for beginners and ‘hands on’ sessions making frames or learning how to detect disease. The aim is to support any local beekeepers, whether they have one hive or twenty. Temporary roadside stalls selling fruit can be found across Fife during the berry season. There are also farm shops just over the Fife border in Perth & Kinross region: Loch Leven’s Larder by Milnathort, Lochend Farm Shop near Scotlandwell, and Jamesfield Organic Centre by Abernethy.